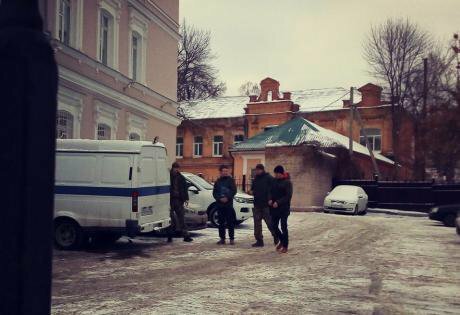 18 December 2018: Andrey Chernov and Dmitry Pchelintsev, defendants in the "Network" case, at Penza courthouse. Source: VKontakte / Green Block Penza. Since autumn 2017, the Russian security services have been conducting an investigation into alleged terrorism offences by Russian anarchists and anti-fascists. As a result, eleven people in St Petersburg and Penza have been arrested and charged in what is now known as the “Network” case — the security services claim that these men were part of an underground terrorist group seeking to sow disorder ahead of the 2018 Presidential Elections and Football World Cup. All eleven men are currently detained awaiting trial in 2019. Several of those detained claim that they were subject to torture by the Federal Security Service (FSB). For example, Viktor Filinkov describes how he was tortured with an electric shocker after being detained at St Petersburg Pulkovo Airport in January 2018. After being detained, Filinkov states that FSB officers placed him in a minivan, and then drove him around the city while torturing him into learning a forced confession. This article by Tatyana Likhanova details the reaction by the Russian security services and other officials to the claims that these men were tortured into confessing to terrorism charges. It reports on investigations into the defendants’ claims of torture by the Russian Investigative Committee, the St Petersburg Public Monitoring Commission, and the defendants’ lawyers. It was published in Novaya Gazeta on 16 December 2018. We translate it here with the author’s permission. “FSB officers don’t work in those minivans. They aren’t there. Physically.” This is how Russian president Vladimir Putin reacted to a statement by Mikhail Fedotov, chairman of the Presidential Council for Civil Society and Human Rights, that defendants in the “Network” case claim they were subjected to electric shock torture in state security service minivans. But Putin admitted that what Fedotov had said was “really disturbing” and that it was “absolutely impermissible”, and promised to “look into it”. Let’s note straight away: only St Petersburg victims of the “Network” case — Viktor Filinkov; Ilya Kapustin, who was questioned as a witness; and Arman Sagynbaev, who was transferred from St Petersburg to Penza after arrest — have reported that they were tortured by the FSB in a minivan. The men detained in Penza were tortured in an investigative detention centre. 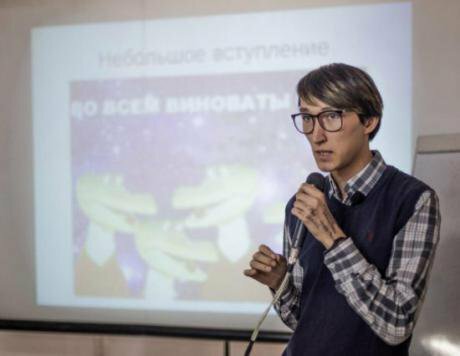 Arman Sagynbayev was arrested and tortured in St Petersburg in November 2017. Source: Personal archive. The St Petersburg FSB officers do not deny that they “work in minivans” and that they use electric shockers while doing so. Their explanations are in documents compiled during an inquiry into Viktor Filinkov’s and Ilya Kapustin’s statements by the Investigative Committee’s Western Military District division. The medical examination of Filinkov when he arrived at St Petersburg Investigative Detention Centre No. 3 mentioned bruising, abrasions and wounds to the top layer of skin, with a note reading “done with an electric shocker?”. 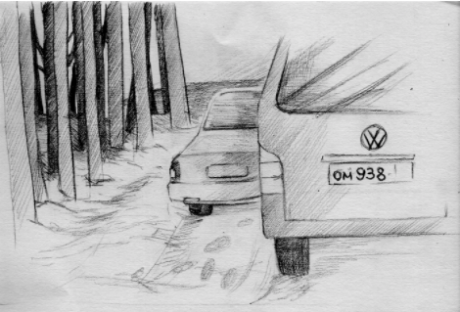 A sketch of the Volkswagen Transporter where FSB officers tortured Viktor Filinkov in January 2018. Image by Alexandra Filinkova, according to Viktor Filinkov's description. Yekaterina Kosarevskaya and Yana Teplitskaya, members of the St Petersburg Public Monitoring Commission (PMC), who visited Viktor Filinkov in the detention centre three days after the events that have been described, noted “a large number of traces of injuries caused by an electric shocker across the whole surface of the right thigh, bruising to the right ankle, and burns from an electric shocker around the rib cage”. Kosarevskaya and Teplitskaya counted more than 30 pairs of bruise marks, characteristic of the shock batons. Filinkov said that he was tortured in a nine-seater blue Volkswagen Transporter, where he was placed by FSB officers who detained him at St Petersburg Pulkovo airport. He was ferried around and tortured for roughly five hours, during which he was forced to learn and recite a confession. Kosarevskaya and Teplitskaya inspected and questioned Filinkov in the presence of a detention centre officer, in a cell equipped with a video camera (the video camera was turned on). Yana and Yekaterina, as well as Filinkov’s lawyer Vitaly Cherkasov, immediately lodged a statement requiring that the video recordings be kept and included in the case file. But they were destroyed — allegedly due to the expiry of the “specified storage period”, as the directors of Investigative Detention Centre No. 3 said in the inquiry materials. This is despite the fact that the detention centre supervisor confirmed in writing that “there are no rules covering the period for which video recordings are stored”. The same thing happened with other video recordings — from CCTV footage at Petersburg Pulkovo airport and the police station where Filinkov was taken “to take fingerprints” — that could shed light on what happened from the moment Filinkov was detained up until his arrival at the St Petersburg FSB building on Shpalernaya Street. Filinkov’s bloodstained hat and trousers, which the defence had also demanded were included in the investigation materials, also disappeared. Almost 30 hours “vanished”, too: the time between Filinkov’s actual arrest and the time given by the investigating officers. In addition, Filinkov’s boarding pass, which is included in the investigation materials, indicates that he checked in on the 20.45 flight to Minsk from St Petersburg on 23 January 2018. The explanations of FSB officers also state that they arrived at Pulkovo airport on 23 January, where they suggested that Filinkov “delay his departure and participate in search procedures”. Nonetheless, all these inconsistencies in the reported times did not disconcert the investigators: the request to open a criminal investigation into Filinkov’s torture was rejected. An inspection into Ilya Kapustin’s witness statement on torture proceeded in a similar manner — and ended with the same result. Kapustin also apparently tried to escape from an official minivan and was also hurt when the driver braked suddenly. In order to stop Kapustin escaping and avoid “consequences related to a person falling out of a moving vehicle”, FSB officers also shocked him several times with an electric shocker. This was described by FSB officers as an “operational necessity”. 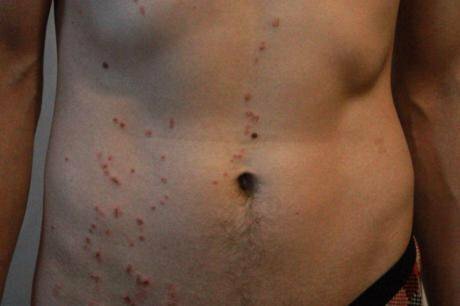 Burns left by an electric shocker on Ilya Kapustin’s body. Photo courtesy of Kapustin's attorney and MediaZona. This begs the question: why did FSB investigator P.A. Prudnikov “working in a five-person operational group” travel to this destination “with the aim of establishing Kapustin’s location”? Why did they not wait closer to Kapustin’s house? Could it be because there is a cafe on the ground floor of Kapustin’s apartment block, and across the road there is a bank and an hi-tech electronics shop? There’s no shortage of CCTV cameras there. Evgeny Myslovsky also referred to information about other defendants in the “Network” case having been tortured. Arman Saginbayev was tortured during a search of his St Petersburg flat and in a car whilst being transported to Penza. In Penza, defendants Ilya Shakursky and Dmitry Pchelintsev made statements that they had been subject to torture. After Vladimir Putin promised to “look into” what happened, the parents of the defendants in the “Network” case have made a new appeal to the Russian president. This appeal notes that existing forensic methods allow for it to be established whether or not torture by electric shock was used even after a very long time. In Penza, the defendants’ legal counsel applied for this kind of examination to be carried out, but Penza garrison court refused to approve this request.